Did you know that the latest Aluminium Patio Doors now offer many gains over the old hardwood or timber products ? Sliding Patio Doors are ideal for large openings such as Glazed Extensions and also for small spaces such as balconies and small patios. We excel in pvc and aluminium patio doors. All are made to order, all can be made to your exact needs and can once again give your home a new lease of life. The latest aluminium patio doors come with very high security as standard, with a choice of hardware and designs. Modern patio doors also now come in beautiful new designs too. Patio doors are ideal for outside spaces big or small or where space can be at a challenge. Unlike opening in or out doors that will take up some space when open, patio doors slide within their existing frame making them ideal for balconies, terraces, patios and gardens. One great feature of new patio doors that you won’t find in old products is “multi-track”. Today you can have patio doors with double or triple tracks so you can choose how your sliding leaves operate. You may wish them all to slide to one side or stack behind each other to maximise your door opening. Whatever your wish there will be a product to suit. Aluminium patio door frames today are also ultra slim compared to the older products and keep much more heat in. Patio Doors in over 200 Colours ! This results in larger glass area letting much more light into the room. Cheam patio doors are available in a choice of designs and in over 200 colours and finishes including metallics and textured too. They are highly secure, energy friendly and virtually maintenance free. You can also choose to have a different colour on the outside and inside too. Visit one of our showrooms in Banstead, Hampton court and Worcester Park if you want to find out more about the latest advanced Aluminium Patio doors in Surrey. People are often surprised to see external condensation on double glazed windows, expecting the cause is a fault with the unit. Condensation on the outside of windows can be particularly noticeable during the Autumnal months. External condensation may occur on the latest energy efficient double glazed windows and demonstrates that the windows are doing a fine job of keeping heat in the building. Many customers may be concerned at this “strange” phenomenon however this occurrence actually demonstrates the effectiveness of the glazing. Previously, where condensation occurred internally the “cold spot” of the sealed unit is now external and proves that the heat is being retained rather than lost through the double glazed sealed unit. The condensation will naturally evaporate once the atmosphere warms up. The phenomenon is a natural and predictable event caused by the outer pane of the glazing being colder that the glass that it replaced. 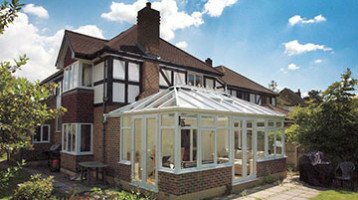 With single glazing and older style double glazing a larger proportion of heat was lost to the outside through the glass. With modern low e glass products more of the heat is kept inside and the outer pane is not heated as much. Moisture condenses out of the air onto a cold surface that is said to be below the dew point. The dew point varies with the air temperature and the amount of moisture it contains. In spring and autumn in particular the glass temperature can fall to a low level during the night and the dew point can be comparatively high in these seasons. The glass is more often likely to be below the dew point in these conditions and the moisture condenses onto the surface. So there is nothing to worry about if you see external condensation on your new double glazed windows. External condensation forms on the exterior surface of the outer pane of glass when its surface temperature drops below the outdoor dew point temperature – increasingly likely on an Autumn or Winter morning, hence why it is only in these current climatic conditions that it occurs. External condensation on double glazing, if it occurs can be caused by a number of factors such as South or North facing properties, location (greater moisture in the northern regions) etc. 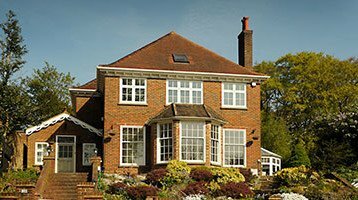 Rather than being seen as a defect of the product, it is actually a tangible sign as far the home improvement experts at Cheam are concerned that the energy-efficient double glazed windows are doing what they have been designed to do i.e. keep more heat inside the home. Are smaller, local companies better than the big nationals?